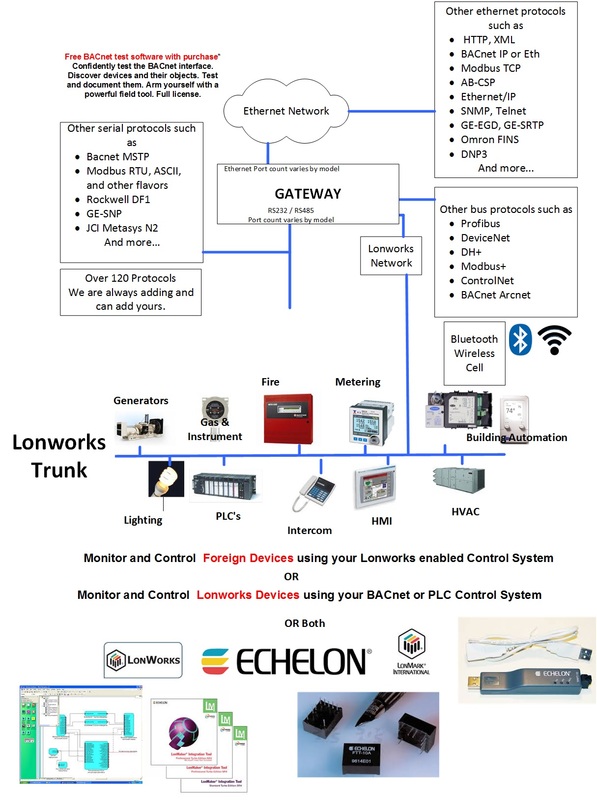 A FieldServer protocol gateway that provides data exchange between LonWorks and Notifier NCA. The NCA (Network Control Annunciator) Serial driver allows the FieldServer to record data from Notifier NCA over RS-232. The NCA (Network Control Annunciator) Serial driver allows the FieldServer to record data from Notifier NCA over RS-232. The FieldServer acts as a Passive Client receiving messages and recording the status of a Notifier NCA Panel. There is no active polling by this driver; the communications are oneway through the panel's printer port, however the driver can generate some system commands like Ack, Reset, Silence and Drill if the FieldServer is connected to the NCA through its CRT port. The panel MUST output messages in English. This driver is not capable of emulating a Notifier NCA panel and the very limited Server functionality has only been implemented to facilitate FieldServer’s Quality Assurance program. 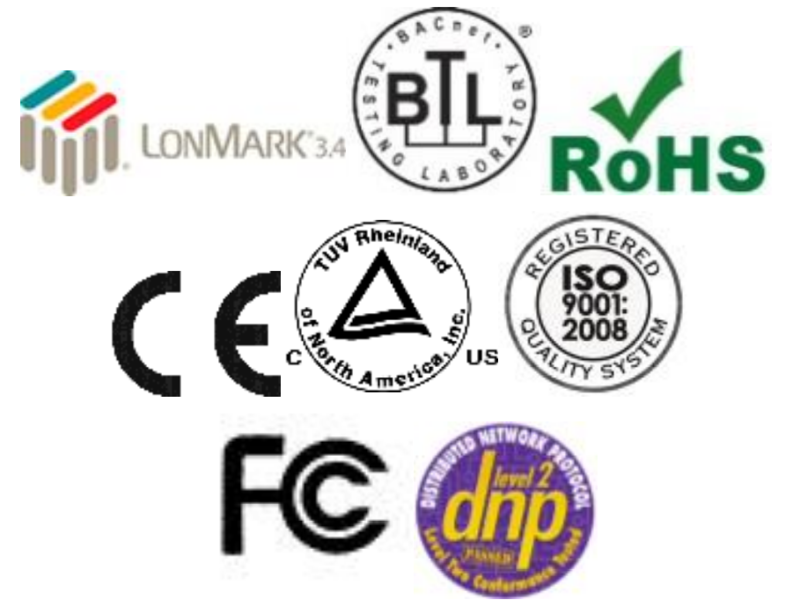 The NCA controls all the devices (e.g. NFS-3030, NFS-640 panels) connected in NOTI*FIRE*NET1 architecture. Each Fire Alarm Panel connected in NOTI*FIRE*NET architecture is considered as a Node. 240 Nodes can exist on one network. 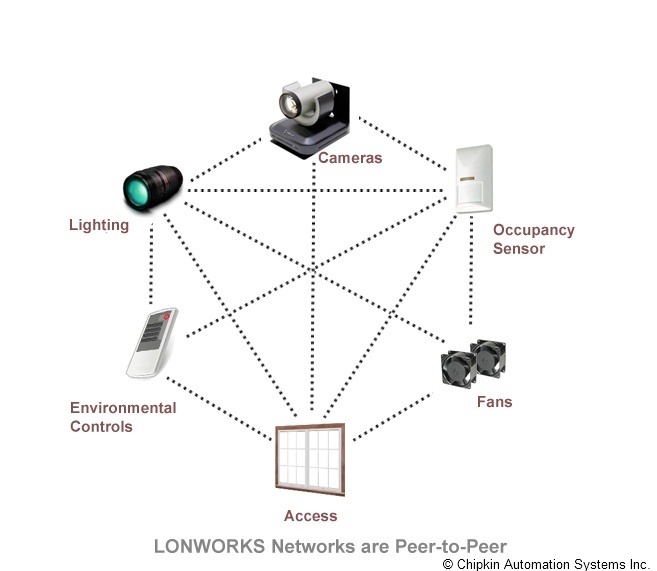 The main purpose of this driver is to record the status of Fire Alarm System detectors and Modules at every Node in Data Arrays - one Data Array per loop per Node. NCA interacts with other Fire Alarm Panels, records the status of all panels and sends the events to printer and CRT ports. FieldServer captures these events in text form, parses and stores them in Data Arrays. These Data Arrays can be controlled by third party tools. Since the FieldServer does not actively poll for data, the accuracy and timeliness of the data is limited to the frequency of update messages that the Notifier Fire Panel issues. 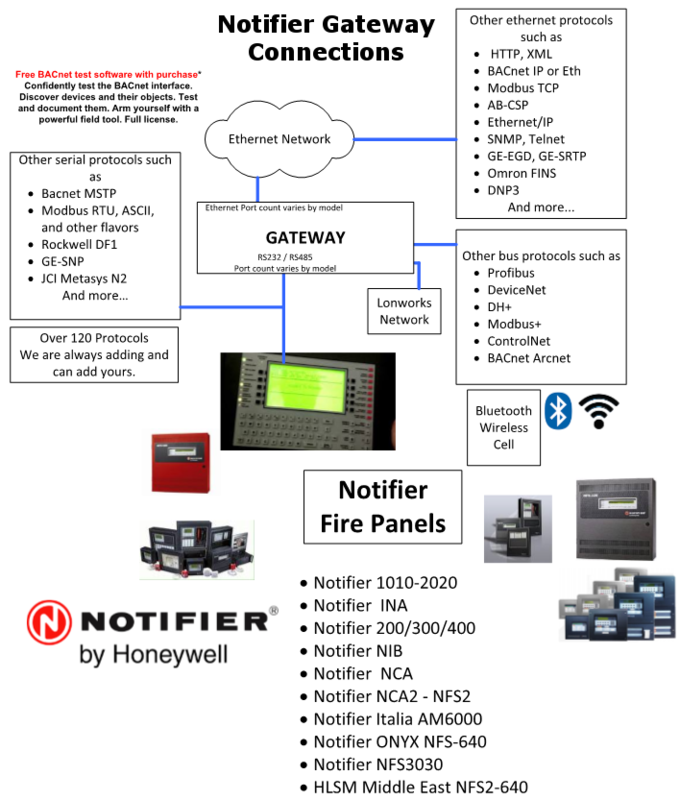 The NCA can connect to additional NOTIFIER Fire Panels (with the proper network software), namely AFP-200, AFP-400, AFP-1010, AM2020, NFS-640, and NFS-3030. Note that when AFP200's and possibly AFP400's are networked they do not send the 'CLEARED' message for latched points via the NCA so it is not possible to detect cleared points unless a system reset is done. 1 For more detail about NOTI*FIRE*NET architecture contact Notifier Canada Ltd. Please note that an NCA panel is theoretically capable of being configured with up to 321 180 points. Although the FieldServer is capable of addressing and accessing each of these addresses, the point limits purchased with the FieldServer prevent the entire database from being accessed in any one application. It is therefore strongly advisable to ensure that only the point addresses of interest are configured, and that the FieldServer is purchased with the correct point count.